One could add new infrastructure projects to the list as well – but suffice to say, there are many positive news stories coming out of Israel. ­­­This is not triumphalism, but an honest assessment, that to simply tell the story of Israel in terms of conflict is well off the mark. 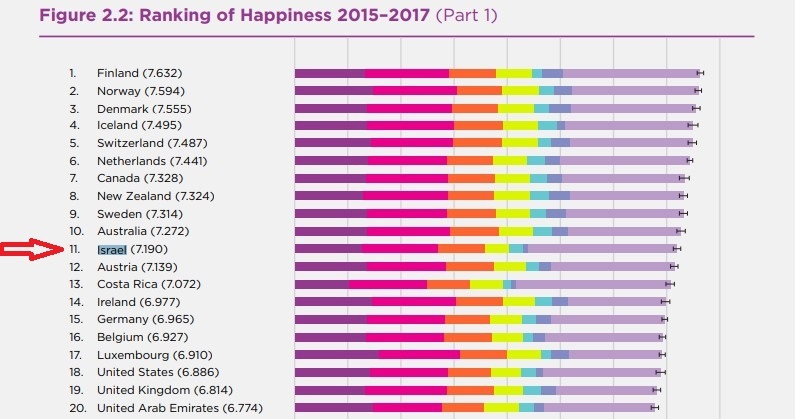 Maybe the story that best captures the disconnect between the media portrayal of Israel, and the actual picture of Israel, is the fact that for a fifth year in a row, Israel was named by the UN the 11th happiest country in the world. The appraisal of Israel as a place of doom and gloom is not shared by Israelis themselves (and that includes Jews and Arabs). The dominant narrative is one that does not hold up to the scrutiny of the facts on the ground. As with every country, stories expressing both positive and negative aspects of Israel should be reported by journalists. We need new, non lachrymose coverage of Israel – because that would more closely represent the truth. Isn’t it interesting that the UK comes in at 19? If their narrative would be accurate then the UK is already in the abyss of gloom. Hahaha! You do realise that it’s still in top 10%, right? That’s hardly an abyss. Michael said this would be true “if their narrative would be accurate.” In other words, he is using their standard to hoist the media on its petard. The Guardian, the Economist and the Independent (and several others) hate successful independent Jews who don’t tug their forelocks. It goes against their whole world view. Therefore, of course they focus on the negative when writing about Israel. Like 2-year olds, they believe that if they can’t see the success, it doesn’t exist. My experience of Israel is also one of a happy society. Even considering the fact that parents have children who end up in the army for three or two years and may well die during that time. Never mind the lethal terror and the economic difficulties ( poverty and hight cost of living ). Despite everything my Israeli friends and acquaintance’s seem much more content than those in Europe or anywhere else. When you are surrounded by those who want you dead you enjoy every day.